A lovely surprise and two odd socks! Lovely!! I have a few things in my queue, but socks will soon follow!!! Can’t wait to see! Love how the yarn is striping!! I now have one sock made 😆 There is a reason why the second half of the sock made up much quicker than the first. I’ll include details in my next post. They are looking great Avis. I am knitting a pair of socks at the moment. Do them when I sit down in the evening. That’s not often though. My wool is similar and does make a nice pattern. Yes, it was a nice surprise to get the stripes. The pattern doesn’t say how long to make the leg part so I hope I have enough for both socks with the length I’ve done. I think I’ll finish one sock and then weigh the wool to see if I still have 50 grams left. Gorgeous yarn Avis, beautiful colour. I’m not a keen knitter. I can do it but it doesn’t grow quick enough. But I would quite like to have a go at socks. Hand knitted socks are special. I agree. It is growing slowly and the wool and needles are tiny but it is a fun project to pick up and put down when I have a few minutes to spare. I can recommend the Opal yarn. It comes in several colourways. Ahh, four double pointed needles. 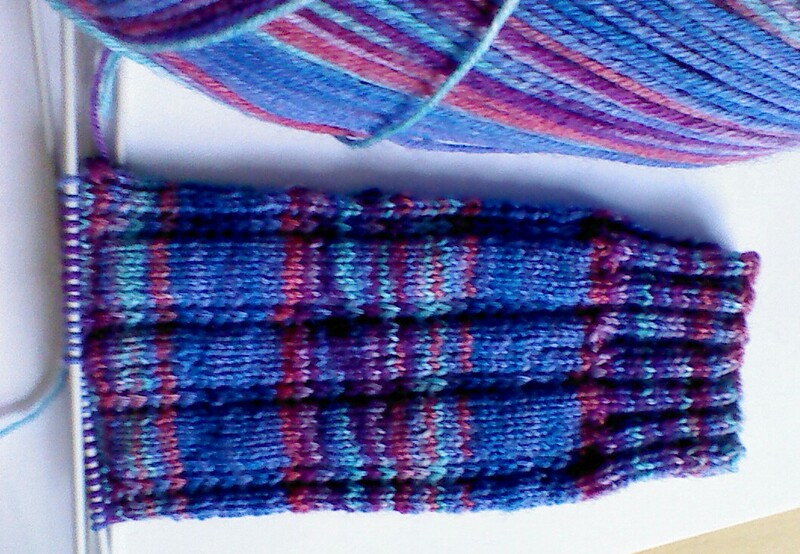 I love them for socks, but always feel appreciative when I switch back to circulars for larger projects. If the my project has a cable or something, and I’m using four needles, I always end up losing or sitting on the spares! Ha-ha! I have to admit my OH has sat on one a few times. Oops! !